With the full liberalization of gold transactions in April 1978, malicious traders used fervent promises to entice consumers with no knowledge of gold. Many people suffered as a result, with some coming to TANAKA for advice. Foreigners at the time believed the Japanese were hopeless with gold. This was because the regulation of gold had continued for about half a century, so the Japanese ended up losing their familiarity with it. When it was deregulated therefore, they had no knowledge of how foreigners bought gold. Country conditions are obviously relevant as well, but it is normal for people outside Japan to purchase gold as long-term assets. 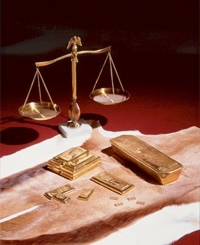 Rather than constantly buying and selling, it is better in the long run to buy and keep gold for generations. The French even have a proverb that translates as; “Old friends and old wine and old gold are best,” which basically says that old things are always the best. We believed that an understanding of gold was essential for consumers to avoid being tricked by dishonest dealers, so we published a pamphlet full of basic information about gold. Japan’s first real gold boom came the year after, in 1979. 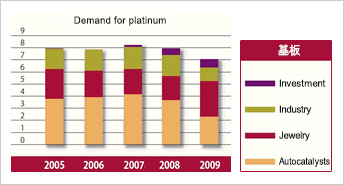 According to Johnson Matthey’s Platinum 2010 review, total world demand for platinum in 2009 was broken up into industrial use (48%), jewelry use (43%) and investment use (9%), which represented a reduction in demand for autocatalyst and industrial use, and an increase in demand for jewelry, compared to the previous year. At the same time, demand for autocatalyst and industrial use combined was about 48%, which showed that industrial demand for platinum remains high. Demand for platinum in industry expanded because, even though platinum itself is non-reactive, it was found in 1812 to promote a chemical reaction in another material through catalytic activity. This activity has been used to control exhaust emissions of nitrogen oxide, and these days over 60% of industrial demand for platinum is for use in autocatalysts. Characteristics of platinum include its high melting point and very low expansion rate, making it a stable metal. Platinum alloy is famous for its use in the International Prototype Metre, which could not afford to expand or contract with heat fluctuation. It is also used to make the platinum crucibles used in various analyses because of its high melting point, and it is an essential material in equipment used to manufacture high-purity glass and glass fiber. More recently, platinum has played a role in promoting chemical reactions between in hydrogen and oxygen in fuel cells. Thanks to such things as being used as the catalyst in next-generation fuel-cell eco-cars that are being researched and developed by automobile manufacturers, platinum is becoming a clean-energy material. Tanaka Holdings started business as TANAKA Shoten, which was then incorporated in August 1918. According to second-generation president Ichiro TANAKA, “The price spread for gold and silver bullion is quite low, and there are many dealers in the business. On top of that, simple buying and selling of bullion is not very interesting.” Instead, he decided to begin full-scale development of industrial demand for platinum. We had had a long connection with platinum anyway, including our 1907 exhibition of platinum crucibles, electrodes and other scientific instruments that received awards at the Meiji Industrial Exposition, platinum recovery from incandescent lamps as commissioned by Tokyo Dento, and manufacturing platinum fine wire. Despite this experience though, processing of platinum was considerably more difficult than gold and silver. Consequently, Ichiro TANAKA brought in French engineer Mr. Quinet in 1930 to launch the company into full-scale development of platinum demand for the industrial sector. Quinet set about researching platinum fine wire and needles, and those efforts eventually succeeded in producing Japan’s first catalytic platinum net. Platinum is still an essential material for controlling automotive gas emissions. The outcomes of Quinet’s research have gone on to enable the ultrafine gold wire technology with which we currently lead the world. In 1936, we also established a platinum and gold refinery in Fukagawa, Tokyo. Indeed, you could say that the history of TANAKA Shoten is the history of the industrial development of platinum.